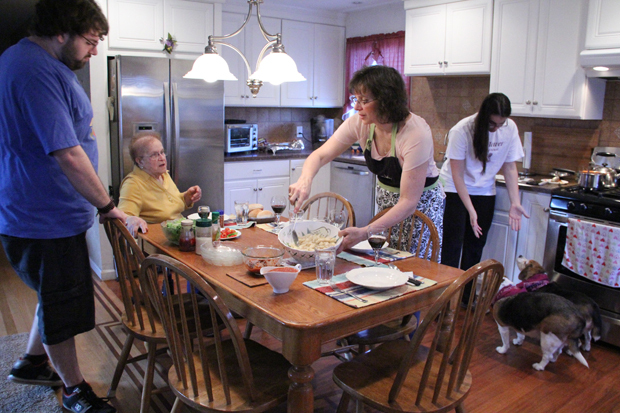 This is the latest story in the series “Faithful Families,” presenting Catholic families ahead of the 2015 World Meeting of Families in Philadelphia. Multi-generational families living together aren’t as common as they once were. Chances are when the kids finish schooling they leave home and Mom and Pop sell the house and move into a condo or apartment, and maybe eventually a retirement facility or nursing home. The Bernaudo-DeLuca family, who live in the Torresdale section of Philadelphia, are a happy exception. 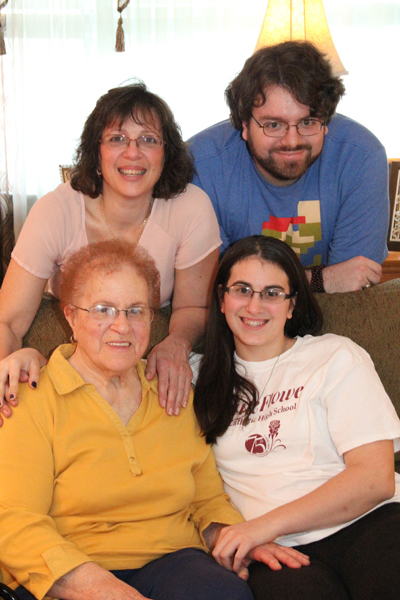 There is grandmother Josephine DeLuca, in her early 80s, her daughter, Joanne Bernaudo and her kids Dominic, who is working for his degree in integrated art at Penn State Abington and Juliana, a junior at Little Flower High School, her mom’s alma mater. Faith in God, a shared love of music and good Italian food are the ingredients of the glue that keeps them together. “We all need each other, our lives are complete with each other,” said Josephine, who is widowed. She herself was originally from the Frankford area, at Mother of Divine Grace Parish and the former St. Joan of Arc. Her love of music surfaced early and at the encouragement of her pastor at MDG, Father John Colantoni, she took organ lessons. What she didn’t know at the time was that the priest was paying for them, and before she knew it, at age 14 she was playing the organ at church for funerals and doubling as soloist on the Latin hymns. She continued to play at churches, most recently St. Joachim, until about five years ago. As an adult, she was employed by Prudential Insurance with on-the-job training in office work. After she married she and her husband moved to Bennington Street in Juniata Park and Holy Innocents Parish. That’s where her three children were raised, including Joanne who was the youngest. A member of the school orchestra when she was at Little Flower High School, Joanne plays the cello and remembers playing for Pope John Paul II at Philadelphia International Airport during his 1979 visit to Philadelphia. When Joanne married she moved away from Holy Innocents, but after seven years, with Dominic 4, and Juliana 1, her marriage disintegrated and she moved back to her mother’s house on Bennington Street. But after a few years she moved to a house a few doors away, and there the family stayed. Eventually, as Josephine developed health issues, she moved in with her daughter. 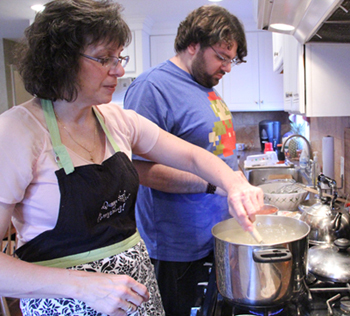 Eight years ago the family moved up to the Torresdale section of the city, but kept their Holy Innocents membership because Joanne is the parish secretary, office manager and a music minister, while Juliana continues as an altar server. After Holy Innocents School Dominic went on to Northeast Catholic High School and finishing at Father Judge High School when North closed. Juliana is following in her mother’s footsteps at Little Flower. She plays the clarinet while Dominic is a saxophonist. Of course, the entire family sings, and as a member of the Archdiocesan Girls Choir, Juliana will get to sing before Pope Francis during his visit to Philadelphia for the World Meeting of Families. As a reprise she will be heading to Rome next January, accompanied by her mother and brother when the Archdiocesan Boys and Girls Choirs will sing along with the Sistine Choir at the Epiphany Mass celebrated in St. Peter’s Basilica by Pope Francis. “I think music is in our blood. You can teach it but some people are born with it,” Juliana said. Although Josephine, who gets around with two canes, has many of the physical infirmities of old age, she very clearly is a productive member of the family. The kitchen is really her domain, often wheeling about with the aid of an office chair. She makes the gravy (spaghetti sauce to the uninitiated), pasta and gnocchi. She mourns for her pizzelle maker which blew up, and she plans to get to Fante’s in South Philly to buy a new one. Everyone in the family cooks to some extent, and Christmas is a special time, with the entire clan working to bake 25 or so varieties of Italian cookies. Sometimes Josephine, who still drives, will go and assist at the parish or if she’s bored ask Joanne to bring some work home. But if she isn’t feeling well, Joanne or Dominic will pinch hit with the cooking, and she loves to do the grocery shopping. Joanne not only works for Holy Innocents Parish, she moonlights as a cosmetician for an area funeral director. That made Josephine’s role really crucial when the children were younger and it is still very important. “She doesn’t realize how much of a help she is to me,” said Joanne, who does the labor-intensive work such as housecleaning and laundry, while Dominic does the heavy-lifting guy stuff and Juliana bakes and takes care of the family dogs, Bella and Lucy. It is not all peaches and cream of course; family living always has its ups and downs, and especially so in intergenerational families. But again, there is food and God. It is the family practice always to eat dinner together. 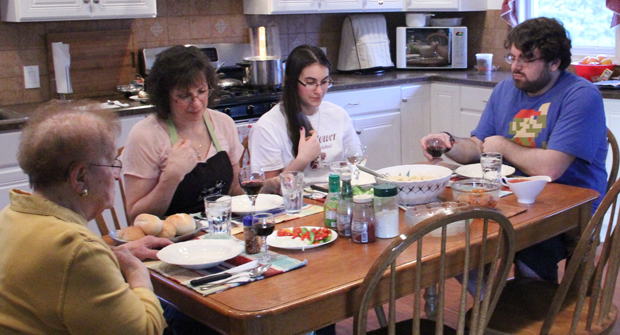 “Our family time is when we sit down at the table,” Dominic said. I grew up in a house with 3 generations: 9 people–my grandmother, her 2 single sisters, my parents and my 3 siblings. We were in Our Lady of Mercy parish on Broad St. We had one bathroom and 4 bedrooms. When we were 4 teens, our mother died. Our father remarried and moved. Mr. and Mrs. DeLuca sang at my wedding at St. Joachims in 1982. Their nephew, Anthony DeLuca was our best man. my husband and Anthony were from south philly, and I was from frankford. Their singing made my day special. sadly, both my husband and Anthony have passed away. both were way too young. my husband bob and I are very lucky to have this wonderful family as our neighbors. Mrs. and Mr. DeLuca were fixtures in Holy Innocents parish for many years, involved in both the parish and local Boys Club. they raised a fine family, obviously Joanne continues with that as well. Dennis, thank you for your kind words. Not only was it great growing up in Holy Innocents, as you also know, I was thrilled to be able to afford my children the same opportunity. Holy Innocents has always been and continues to be an amazing school to educate your children.